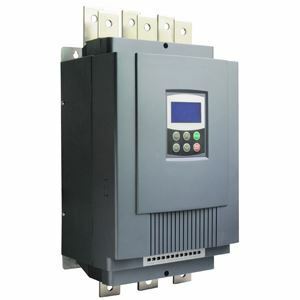 40 hp soft starter, 30 kW three phase 240v, 420v, 480v, 660v AC motor starter. Model GS2-030 (240v), GS3-030 (420v), GS4-030 (480v), GS6-030 (660v). Motor soft starter does help in reducing inrush currents, most soft starters come with an adjustable kick current to overcome the initial inertia needed. Once up to speed it does switch over to being across the power grid. Be careful here if you ever expect to start ATL, the manufacturers generally reduce the size of the bypass contactor. Harmonics are nasty as well running through the SCRs during the start sequence. Variable frequency drives (VFD) come in a variety of front ends from 6-pulse, 12-pulse, 18-pulse, and active front ends. Harmonics are present in all variable speed drives applications so be aware of these and their effects.